Butches love glasses. Butches also love contacts. Butches really love sunglasses. I know I’ve posted before about eyeglasses, but it’s time to update! I first bought my glasses online about 8 years ago– honestly, I can’t believe it’s been that long already, but it has! Just before the winter holidays, I updated my prescription once again and purchased a few new pairs so I have some reviews to share. Coastal makes a great product at a good price, and they arrive incredibly fast. I picked up the Randy Jackson RJX123-46 in tortoise, which they seem to be out of now. I love the fit and the look of these– they remind me a little bit of Moscot which I am in love with, but can’t really afford. (Last time I was in NYC, I went to the store and tried a bunch of them on. I was sad when I walked out because they made my heart beat oh so quickly.) Coupon code FRESH30 for 30% off right now! Because I have a hobby that requires me to look at small things up close for a long time, I have a pair of glasses that are my regular prescription with a magnifier of 1.5. These are the Venus from EyeBuy Direct, which I really have been pleased with. They make a good product for a decent price and shipping is pretty fast. FRESH20 is a coupon code that works there right now. these are the Venus from EyeBuy Direct. So I’ll have to update this post because I am going to order my first pair from Polette soon! I started cross-stitching many years ago. Mostly I do portraits, but sometimes I do other stuff. I do have an Etsy shop, and I like to use Etsy as a place to find fun and interesting things. One of the things I appreciate about Etsy is that you can find a lot of unique and handmade gifts, as well as a lot of fun queer and feminist gifts. Right away, I started shopping for some super awesome additional bands because I appreciate the versatility. I wear my watch every day, and really appreciate being able to change the band to go more with whatever I’m wearing. So far, I’ve purchased 4 extra bands for my watch. Two were purchased on Amazon– one is a copy of the Apple Milanese loop which I adore, and the other was a blue weave purchased for a special occasion. It didn’t make it on to my wrist though–it ended up looking cheap and purple. The other two were purchased from two different shops on Etsy. The first one is a black and red striped band that I purchased from Made by Kong. This is an incredibly sharp looking, sturdy band. It has softened up a little bit with wear– if I wore it daily, I think it would soften up more, but I only wear it from time to time. The second one is a black leather band from Toltec Wear. I am happy to report that this item is really beautifully made, soft supple leather. I had a great customer service experience with them– the original band arrived and was just a little bit too short, so they sent me a replacement within one week of contacting them. Hey folks, it’s bee listy stopping by to help out my comrade during NaNoBlowPop month, or whatever this blogging extravaganza is called. Tonight I want to talk to you about something very near and dear to my heart: eyeglasses. I’ve been wearing glasses since 1987. My first pair was a big round red Sally Jesse Raphael-type frames, and I had to wear those frames for 3 whole years! I’ve had many spectacle looks over the years, but the high price of glasses used to make it hard to keep one’s look updated. In grad school, I had to get my first pair of bifocals. I was barely 25 years old, so I indulged my vanity and paid the hefty price for no-line progressives. The next pair I got cost me about $400 before my insurance. My beloved DKNY frames...they were brown w/ blue and green around the lenses with a library temple. And they cost $400 before insurance. RIP. The first pair (pictured below in 1) that I ordered from Zenni Optical were the luckiest thing ever. Because my first pair was a success, I was willing to keep trying. I really liked the fit & the look, and the price– $12.95 plus shipping. (I didn’t get the anti-glare coating on them.) So I ended up ordering a similar pair in black, and I ordered some sunglasses ($17). These were my first prescription sunglasses, and I was overjoyed! I started reading outside, driving into the sun, and it was lovely. Eventually I tried a few new frames to add to my collection. 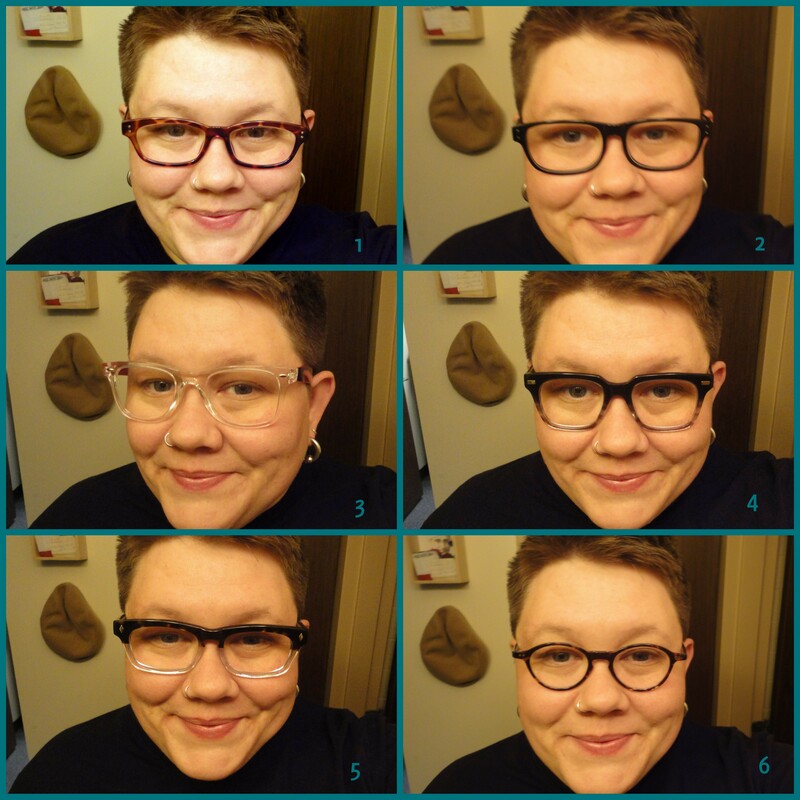 Some were hits, some were misses…then I came across some frames from Warby Parker that I really wanted, but it was time to update my prescription. It had been three years, and there was a significant enough change that I needed new lenses, so now I have three current pairs (4, 5, & 6). 1: from Zenni Optical – no longer in my rotation because the prescription is outdated, but I still love the frame–so I’ve ordered them in sunglasses. 2: from Eye Buy Direct – These are the Ronnie. I didn’t wear them very often because they were too wide. They didn’t sit right on my ears, but they were a good back up pair. No longer in the rotation due to the outdated prescription. 3: from Zenni Optical – it’s hard to see in the picture, but the temples are bright red. When I first got these, I didn’t like them. I felt like the prescription was wrong–but that was my fault. My prescription was outdated. The look of these grew on me, but I only wore them out a couple of times. 4: from Warby Parker – Winston in Lunar Fade. I’m in love with these. I love the home try-on system that Warby Parker offers, and I also love that when you order a pair, they give a pair to someone in need. I also had a really awesome customer service experience with them. Before I realized how outdated my prescription was, I tried to order these in my old prescription. They wouldn’t fill a prescription more than 2 years old, which might piss some folks off, but I appreciated it because i didn’t realize it had already been 3 years since my last regular eye exam. (I had a secondary prescription in that time for close-up work, but I wanted these for everyday usage.) They came quicker than expected, which made me very happy. 5: from Spex Club – Hobbs in clear/tortoise. I love the heft of these– they feel heavy and sturdy in my hand, but not on my face. I like the shape of these a lot, and I purchased them with a 50% coupon that I scored on Fab. They also came very quickly, and the anti-glare on these is so good that they almost look like I have no lenses in. 6: from 39 Dollar Glasses – Tennyson. One of the few disappointments I’ve had in the past few years of buying glasses online was this situation. Over at Glassy Eyes, there’s a review of their service that replaces lenses in your old frames with your updated prescription. I paid $39 to have this done to the DKNY frames I gush over above. I paid in advance, sent them in, and waited…and got an email from their lab manager that my frames had broken in the processing. I was really bummed, but they suggested I choose another frame from their inventory. I chose the Tennyson, worried that they might be a little bit small for my face. When they arrived, I felt that my suspicion was right, but my partner loves them, and a couple of my friends have decided that I look like an old fashioned socialist intellectual, which is fine by me. I’m still disappointed that the DKNY frames I loved so much are lost to damage, but so it goes. I’m more than happy giving reviews and tips to folks who want to try this out– so please feel free to ask questions about buying online glasses! Yeah, my life has been a succession of crazy followed by more crazy these days. Bee has been helping hold down the fort but I still love writing here and miss you guys! Our baby is due to arrive anywhere from 3-7 weeks from today and we’re trying as hard as we can to prepare for something we have no idea how to prepare for. And buy lots of stuff. Ok, well, we’ve been gifted many many wonderful gifts but the idea of one of us not working for quite some time has me panicking just slightly over finances – so I’ve been practicing a lot of restraint and there’s been next to no personal shopping going on. However, I have been doing a little blog reading – one of my favorite’s these days is The Dapper Dad. Not just because I’m about to become one, but because he is one classy dude. Recently he showed me what my next favorite piece of jewelry is: A fishook bracelet from Michael Saiger. There is a black leather one on the site that I’m pretty much stiff over – however there’s the daddy brain in me saying “yeah – but you’ll put her eye out with it.” And that my friends, is parent preparation. I figure it’ll be about 10 years before I can consider “dangerous” jewelry. Or…maybe my pretty lady love will figure out a way for it to be mine for special occasions. What’s on your covet list these days? There is only one Sartorial Butch…but this blog has another writer. I wanted to take this opportunity to introduce myself and talk about a favorite topic. I’m bee listy, a good friend of the Sartorial Butch. It seems that some major life changes are coming to the Sartorial Butch and the Sartorial Love–they have a baby due this summer! I’m naturally thrilled to become a butch uncle yet again to the child of good friends, and was even more excited when SB asked me to help fill in some gaps on this blog. I’ve been behind the scenes of The Sartorial Butch since inception–I’m proud to say that i encouraged SB to start this party. Some things about me: I identify as a queer fat butch. I am a caucasian, female assigned at birth person who uses female or gender neutral pronouns. I live in the midwest. I have two college degrees, and due to my career I am likely identifiable as middle class, although I grew up working class. This brings up a great deal of issues of transclassness (is that a word?) I live alone, more or less. I am in my early 30s. This is my perspective, and I do not purport to represent anyone but myself. Just to be clear. How I ended up here… I wanted a butch clothing blog to read & engage with, but at the time I didn’t feel like I was a dapper enough dresser to be the one to write it. I’m proud to say that in a lot of ways, that has changed. Since it’s beginnings, I’ve been closely following the ideas, suggestions, and discussions on The Sartorial Butch. I can honestly say that in the time I’ve been friends with The Sartorial Butch, I’ve grown an incredible amount with regard to my own sartorial butch expression. The most game-changing day of my sartorial life was the day that she suggested that I try out wearing a bow tie. I first thought of David Sedaris’ essay “Buddy, Can You Spare a Tie?” which appears in When You Are Engulfed In Flames. Sedaris’ friend Frank declares that “A bow tie announces to the world that you can no longer get an erection.” When I first read this, I thought something akin to oh dear, I don’t need to be making any public declarations about my erections. I also thought that due to my double chin, it would be a terrible idea. But the idea kept rolling around in my mind, and finally I decided to pull the trigger on that idea. Instantly, a bow tie lover was born. One of the things I love about bow ties is that it pulls the eye up to the face, away from my chest. I had a breast reduction in the 1990s, but I am not flat chested. I love wearing traditional neckties, but I hate the way the curve of my chest makes a bump in the line of my outfit, so when I started wearing bow ties, I noticed how that changed my perspective. My first bow tie was a pre-tied grey (with skulls)* little sweetie that I was petrified to wear out in public. The first time I wore it, I put it on with a striped pinpoint oxford shirt and a favorite black pullover sweater from Banana. That sweater has great details (toggles, but just at the neck) and I thought I could sneak the bow tie inconspicuously. I walked into the office and my administrative assistant exclaimed that she loved my bow tie. Over the course of the afternoon, I got a great number of compliments both in person and online. Immediately, I was sold. I wanted more. 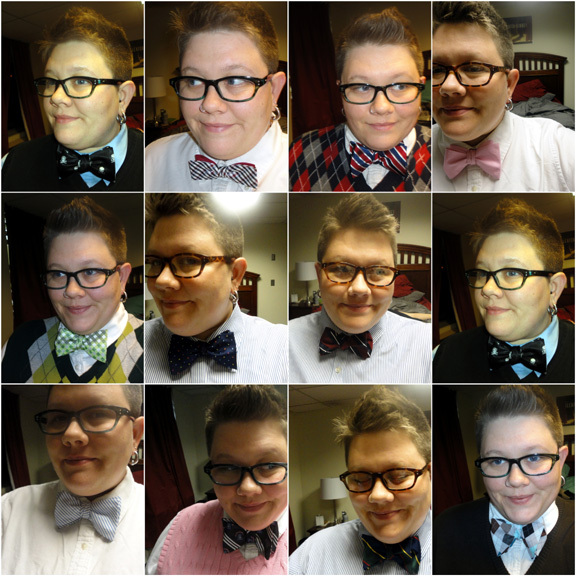 In the subsequent months, I have amassed quite a reasonable collection of bow ties. All of my new ties are self-tie. I have met and talked with other bow tie wearers, I have added two vintage clip-ons that belonged to my beloved grandpa to my collection, and thanks to Brooks Brothers’ friends & family sale, I have now added a reversible bow tie to the mix. I get an incredible amount of positive attention from a wide array of people–and reactions are varied, honestly. Sometimes I get pretty confused and/or dirty looks, but I get tons of positive attention from queers of all varieties, and some straight folks love it too. I have progressed in my commitment to the bow tie where I wear one every single day to work (I am in administration at a large, midwestern, public university where I am one of only a handful of visible butch folks on campus–including students). I realize that the bow tie isn’t for everyone, but it’s perfect for me. I’m a little bit southern, a lot dandy, and generally my style is preppy/professorial. *honest disclosure: that first bow tie I purchased was pre-tied, but it quickly fell apart. I replaced it with a self-tie in the same pattern. 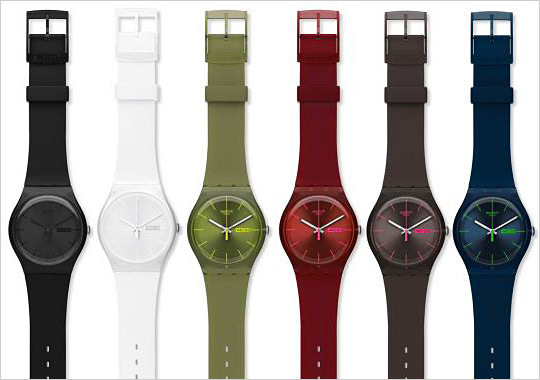 I have always loved Swatch watches. From my first Flik Flak watch, to my Pop-Swatch in middle school, I’ve always thought they were cool as heck. Now they have a New Gent’s Collection – and it’s awesome. The one on the left, the “Black Rebel,” but damn, the colors are awesome. What have you seen lately that’s hot?